Kelrick currently oversees the Indigenous department at the ABC. Kelrick is a Ngarluma/Bunuba man from Broome WA and started as a cadet radio broadcaster for Goolarri Media. Moving to Sydney in 1998, he presented ABC Radio National’s Awaye! and was the inaugural presenter of ABC TV’s Message Sticks. 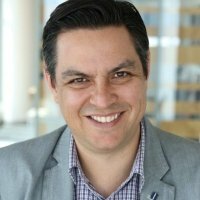 In 2002 he completed his Masters in Documentary Writing and Directing at AFTRS, and in 2007 returned to WA to become NITV’s Commissioning Editor. He formed Spear Point Productions in 2010 – credits include documentaries Yagan, Outside Chance, Prison Songs, and short drama, Karroyul – a 2015 AACTA Award nominee. Kelrick was most recently the Indigenous Manager for Western Australia’s state screen funding agency Screenwest. Factual series that dig deep into unique stories and worlds we haven’t seen before, or characters that we don’t see on TV every day. They can be issue-based, cultural, political, historical, or presenter-led, but must be contemporary in tone and style. Documentaries that are big, untold stories of personalities, events or movements that have shaped Australia eg Blue Water Empire.